Hsin-Yin Lee, a former associate producer at Worldfocus, is a news editor at the “China Times” in Taipei. China’s 18-year-old Olympic champion has recently learned something — it’s OK to thank your parents for your success, but always remember to first thank your country. Zhou Yang, who won a gold medal in the women’s 1,500 meters short-track speed skating during the Vancouver Winter Olympic, has come under fire — and been complimented — for mentioning her parents but failing to thank the country after the award ceremony. Sports officials, however, have found Zhou’s candid words lacking. During a group discussion of the annual meeting of China’s legislature last Sunday, Yu Zaiqing, deputy director of the National Sports Bureau, expressed doubt about Zhou’s patriotism. “It’s fine to thank your mom and dad, but you should still thank your country first and foremost,” he said. 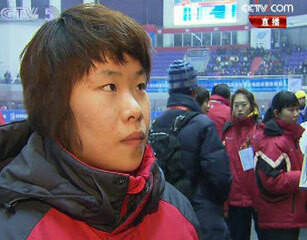 Yu also said the authorities should enhance the “moral education” for China’s athletes. China’s athlete training programs have long been criticized as both inhumane and ineffective. Zhou’s story reminds me of the Australian Open earlier this year, when two Chinese players, Zheng Jie and Li Na, marched to the women’s semifinals. It was the first time the world’s most populous nation had advanced so far in a Grand Slam. While the head of the Women’s Tennis Association lauded this as an example of Chinese tennis coming of age, critics said a more flexible national athlete training system, in place since 2008, played a key factor. Zheng and Li were among the four top tennis players in China who were granted unprecedented freedom in managing their careers. In other words, they are free to select their own schedules, coaches and teams. With less obligation to China’s national athletic development system, they are also able to pocket more prize money and give less to the Chinese Tennis Association — which surely raises the motivation to compete. Should the current athletic system in China be further modified so that people like Zhou Yang can be both a happy player and a happy person? I think so. After all, sport is all about humanity, and only when a person’s mind is set free can he or she pursue greater physical strength. It should be China thanking the skater for winning the gold – not the other way round. I am very happy for Zhuo Yang; and yes a clear minded, happy person will go and accomplish much more. China should definetley modidy their athletic system.